Don’t get caught in the cold this winter. The Cuyahoga County Veterans Service Commissioner Winter Clothing Program is here. 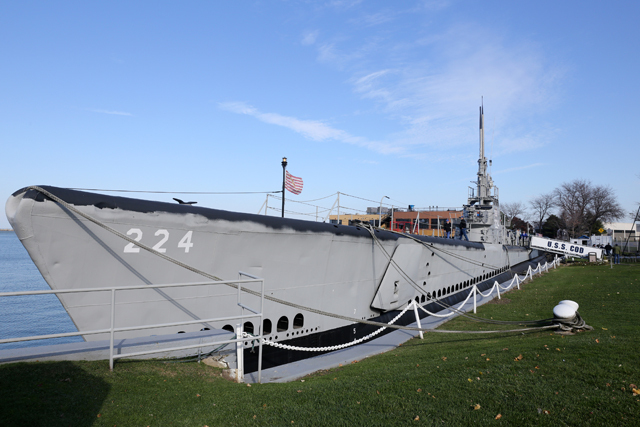 Amazing, strange and spooky tales are promised for a special Halloween program aboard the USS Cod Submarine Memorial on Friday and Saturday. For tours and tale-telling, the interior of the vintage World War II submarine, docked off East Ninth Street at the North Coast Harbor, will be bathed with the red lights normally used when surfaced at night. The sub’s deck gun will also be periodically fired, ostensibly to ward off the mythical Lake Erie Monster. Guest Speaker Major General (ret) Robert P. Stall, Executive Director, Cleveland Clinic International Operations. Topic: Leading as a citizen soldier. College Credit for Military Training? Many veterans may not be aware that their military training may be eligible for college credit. That’s why the Tri-C Veterans Initiative will be holding a series of workshops the week of October 24th to help you start the process of having your military training transcripts reviewed for the possible award of college credit. For more information, contact Rick Dechant at Richard.DeChant@tri-c.edu or 216.987.3193. Veterans’ Business Forum: Your Small Business Deserves a Promotion Small Business Administration and NEOVETS, will be co-sponsoring a Veterans’ Business Forum on November 8th at Tri-C’s Corporate College East location at 4400 Richmond Rd., Warrensville Heights. This program is for new and existing veteran-owned businesses. It will provide you with useful information to help your business start and thrive. COST: FREE but registration is required. Veterans’ Day Tri-C Ceremony: on Thursday, November 10th the Veterans Initiative will be conducting the College’s Veterans Day Ceremony at the flagpole in the Veterans Memorial Garden at the West Campus. The West Campus is located at 11000 Pleasant Valley Road in Parma. Activities will begin at 11 am. And will include a presentation by WEWS TV5 newsman and decorated Vietnam Veteran, Leon Bibb. This ceremony is being held on Thursday as the College will be closed Friday, November 11th for Veterans Day observance. This event is FREE and open to the public. Call (216) 987-3193 for further information. Cleveland Veterans Day Ceremony / Veterans Day Parade: the City of Cleveland will host the annual Veterans Day ceremony at 11 AM, Friday, Nov 11, 2016 in the Rotunda of City Hall followed by a Veterans Day parade, scheduled to step off at 12:30 PM. Enrolling for VA care is a life-changing decision for Veterans. Choosing your health care provider is a leap of faith that will impact your entire life. “Welcome to MyVA” (W2MyVA) starts that relationship right with a welcoming call from an informed, service-oriented VA representative. Career Connection is a unique opportunity for those who would like to improve or ignite their career by establishing a connection with lead IT security organizations and engaged practitioners. Students, Veterans and all who seek to enhance their job status are encouraged to pre-register for a half-day of security insight, involvement, and introduction. If you are entering the civilian information security industry after graduation, military service, or a non-encouraging career, you MUST attend this event for a once-in-a-lifetime opportunity to meet with the area’s top IT security professionals. The 14th annual Information Security Summit convenes N.E. Ohio’s largest gathering of visionaries and practitioners and has asked this collective leadership to donate their insights for the career betterment of their next potential cohorts. Within the afternoon of Wednesday, October 26th many of the Information/ Security Summit Week’s vendor partners will volunteer a half-a-day of their time to discuss career paths and possibilities with those interested in a role in IT security. Attendance is by Pre-registration only, there is a $29 Registration Fee—scholarships monies are being pursued and will be available based on achieved corporate donation. Veterans may secure a FREE resume and networking skills review ahead of the Career Connection from GunnyRet Consulting LLC. Bryan A. McGown, “Gunny”, is a successful Veteran job search coach, and is very involved in several non-profits that serve Veterans and military families. A networking ‘Pit-Stop Cafe’ will be accessible to aid all career-building attendees to sharpen their connection abilities during the event. The evening will close with an Xceptional Networking Reception open to all 21 years of age and older. Attention Military Veterans: The Social Security Administration is awarding prior military service men and women credit towards their SSA earnings! You don’t get it automatically, you have to apply. For a certain period, you get $300 each quarter of a year you served in active duty or reserve. Here are some great opportunities to put your military experiences to work benefiting others in need. Project GreenCare for Troops: a national 10-year old program that provides free lawn, landscape and snow removal services for military families and veterans with a service-related disability needs your support. There are more than 225,000 military personnel deployed in 150 countries and 3.6 million veterans with a service-related disability needing day-to-day household and lifestyle assistance. The American Red Cross’ unwavering commitment to members of the U.S. military, its veterans and their families continues to grow and develop more than a century after Clara Barton first recruited nurses to support the U.S. Army. Today, the Red Cross is meeting the needs of a changing military and expanding services to veterans. Red Cross support of military members and their families enhances morale and contributes to increased operational capability in several ways. New volunteers: visit https:redcross.org/neo Click on “volunteer” tab. Cleveland Municipal Court’s Veterans Treatment Docket needs volunteers – preferably military veterans to help Veterans transition to a successful life. If you are interested in volunteering to help our veterans successfully re-enter civilian life, please contact Derek Moore at (216) 664-4712 or via email at moored@cmcoh.orgfor additional information.